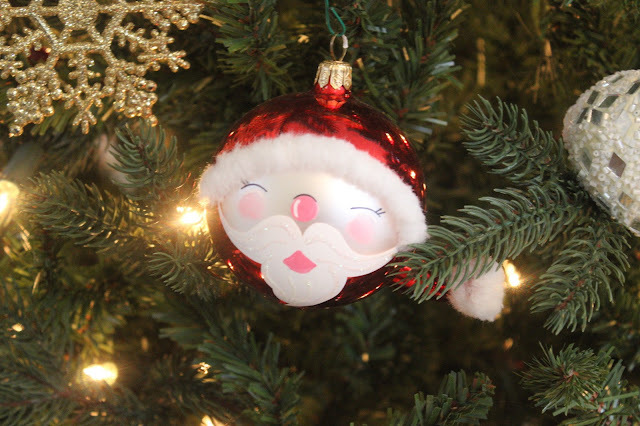 Merry (almost) Christmas! 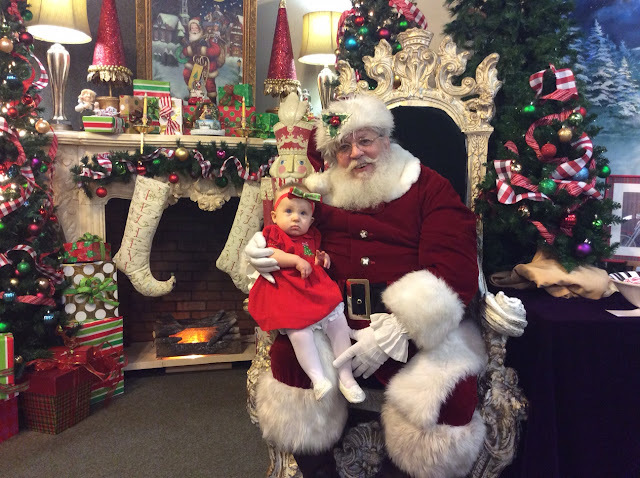 I am so excited to celebrate Madeline's first Christmas this year. We will be staying in Charlotte and celebrating at our home in the morning and then enjoying a late lunch at Corey's mom's new home. A full recap to come soon! 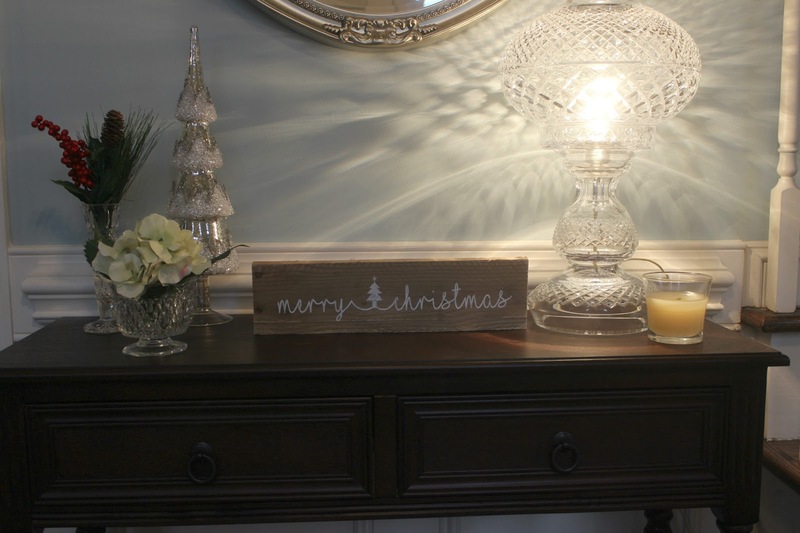 I kept our foyer very simple by adding this reclaimed wood sign that a local mom made, switching up my florals, and adding the mercury glass tree. In my childhood home, we lived in an old victorian house with 8 fireplaces and my mom always did Christmas villages on each one. 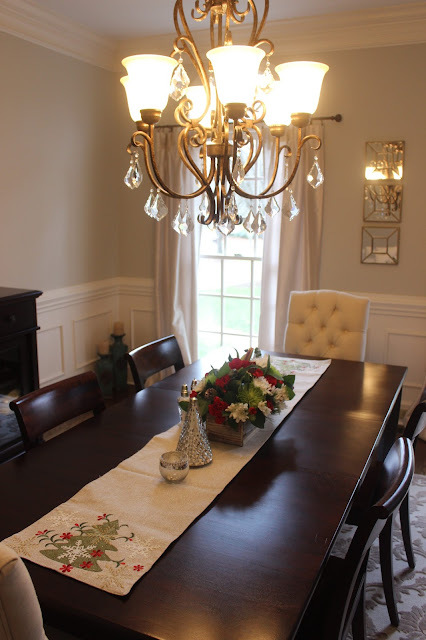 My intention is to go through some of those decorations over the next year and bring a few of my favorites to decorate this table next year. This worked for now, though, and was a simple way to transition from our fall decor. 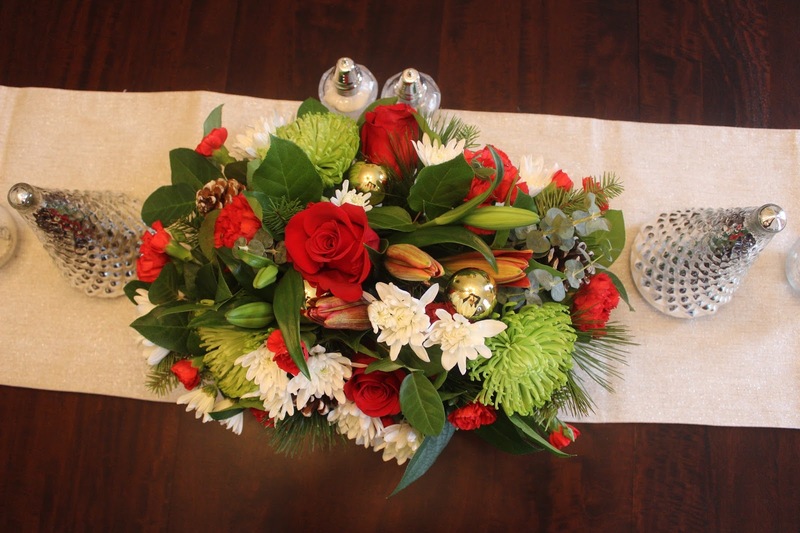 For the dining room, I added a holiday table runner, two crystal trees from Target, and this beautiful floral arrangement that Corey brought home for me. Isn't it gorgeous? Our tree is in our family room. 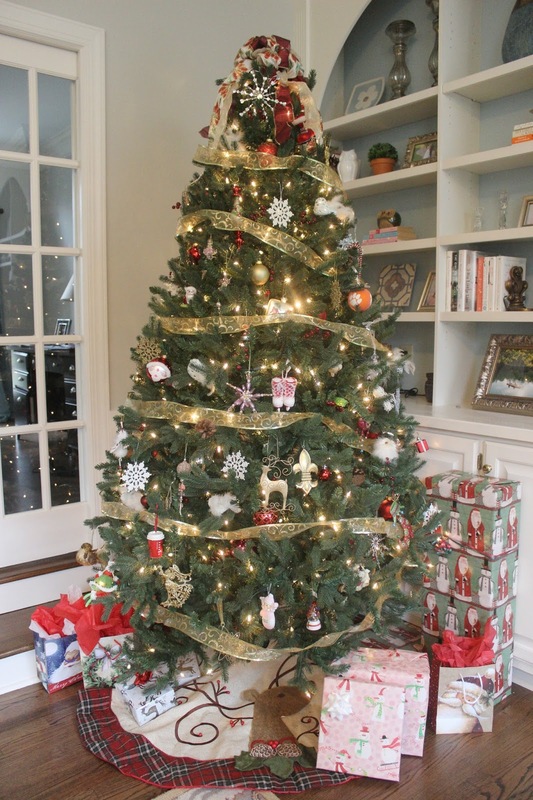 I always do an artificial tree. It is just my preference, perhaps because that's what I had growing up. My tree is not a show stopper this year. In fact, the bottom foot is not even decorated because Madeline is obsessed with the lights and ribbon. I made my bow topper and my tree skirt is from Pier 1. I'm ashamed to say my presents don't look quite as photogenic as usual, either. I guess I wasn't as on top of things this year! Corey and I recently had our fireplace converted from wood burning to gas logs and it has been going daily this month. I so missed having a gas fireplace. My mom made all of our stockings and they are pretty cute and whimsical. Madeline is obsessed with the Santa and sparkly reindeer and knocks them over pretty much daily. 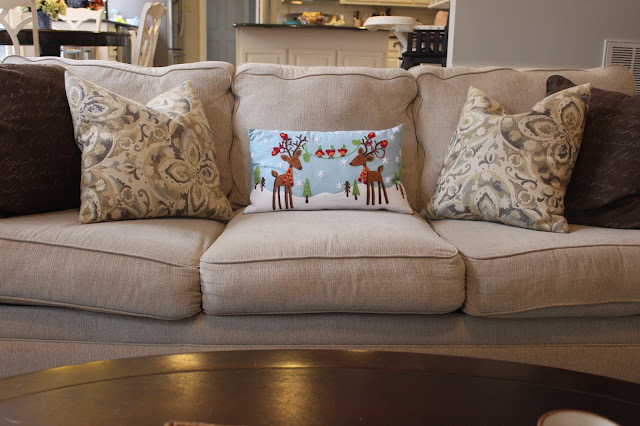 I swapped out my fall lumbar pillow for this cute reindeer one and added Christmas throw pillows to the bonus room and bedrooms, too. 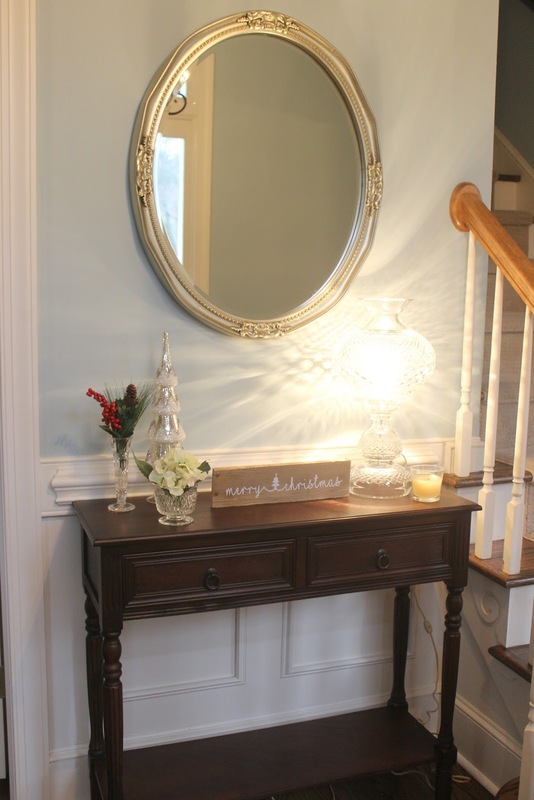 Its such an easy way to add just a little something around the whole house. In our breakfast nook, I added some red berries to our floral arrangement and hung these beautiful "Joy" wreathes that Corey's mom passed down to us. 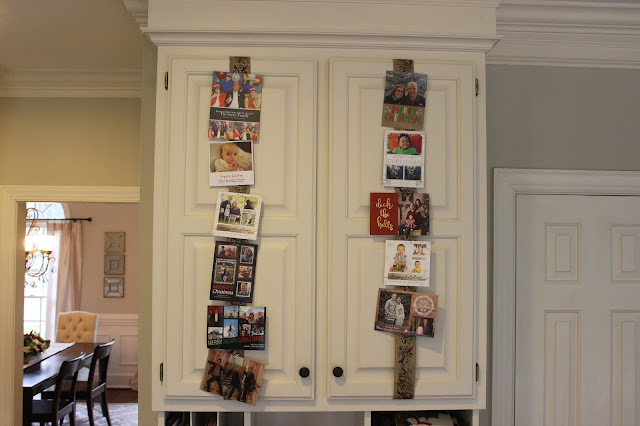 I am displaying our Christmas cards on the cabinets in our little breakfast-nook desk area. This was so easy. Just attach the ribbon to the cabinets (I used picture hanging command strips so I can put it back easily next year) and hot glue tiny little clothes pins for the cards. 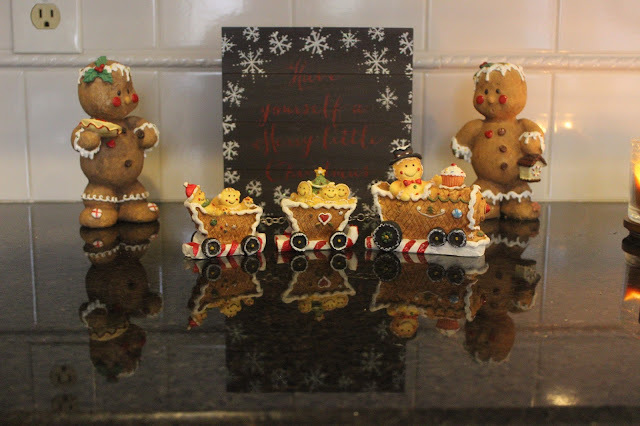 I have this little gingerbread men setup in our kitchen along a really long countertop. I've had them since my very first apartment so I can't remember where they came from but the Christmas sign is from Target's dollar spot. Of course Madeline has her own little tree to use as a nightlight. It is decorate in pink, white, and gold ornaments and needs a pretty bow topper next year. Our decorations are truly a work in progress this year. 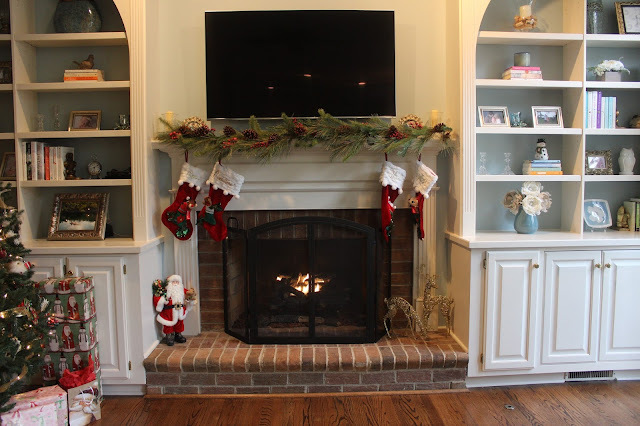 They certainly add some Holiday cheer to our home but don't feel finished. Outside, we only have a wreath on the front door. 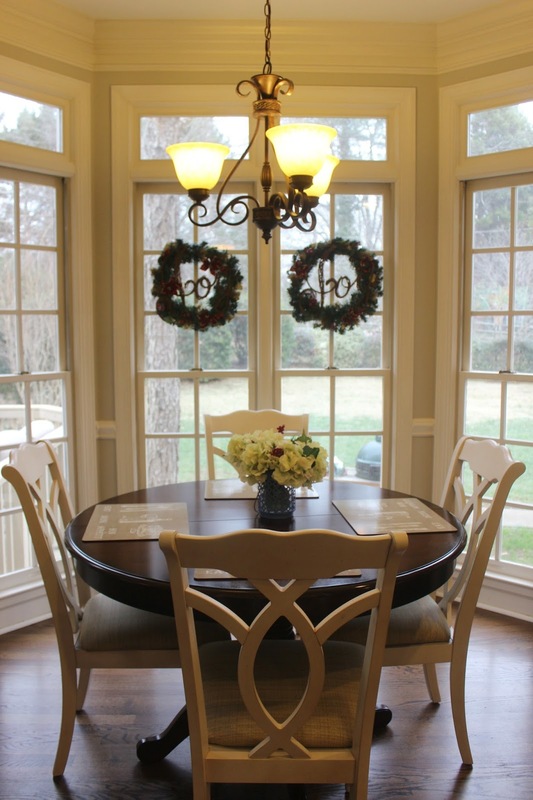 We used to do wreathes and candles in all our windows in our old home but have so many more windows facing the front that that will be a project for next year, for sure! I have to say I haven't really felt on top of Christmas this year. But, its because I've been spending all my time with this precious girl. Merry Christmas from our family to yours! You can see my 2015 home tour in our old house here and my Fall home tour here. So pretty! The decorations are darling and the place looks super cozy. Your home looks gorgeous!! But yes, I know how you feel about not being on top of decorations...crazy how much time being a mom takes up!!! 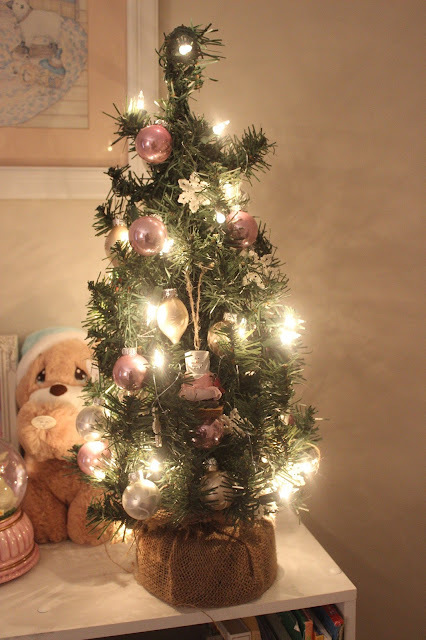 It took me a week to decorate our tree! So many cute things! 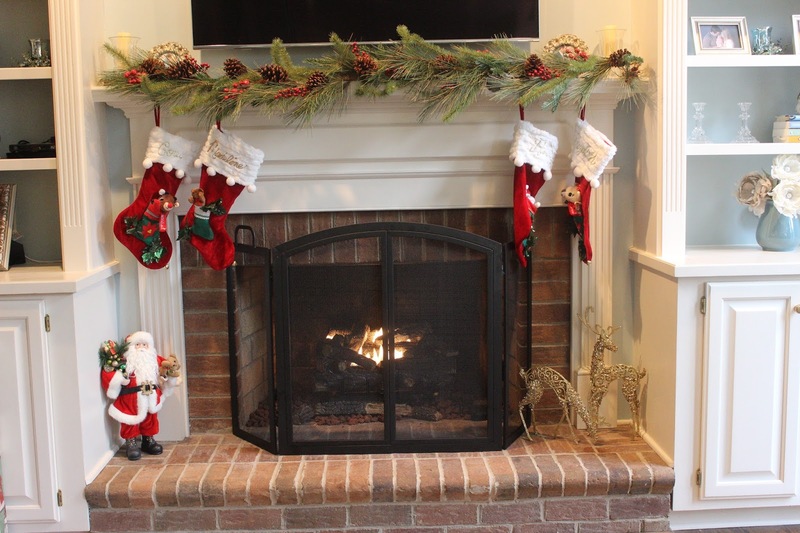 I love, love your mantle with the garland, the stockings and those fun reindeer! 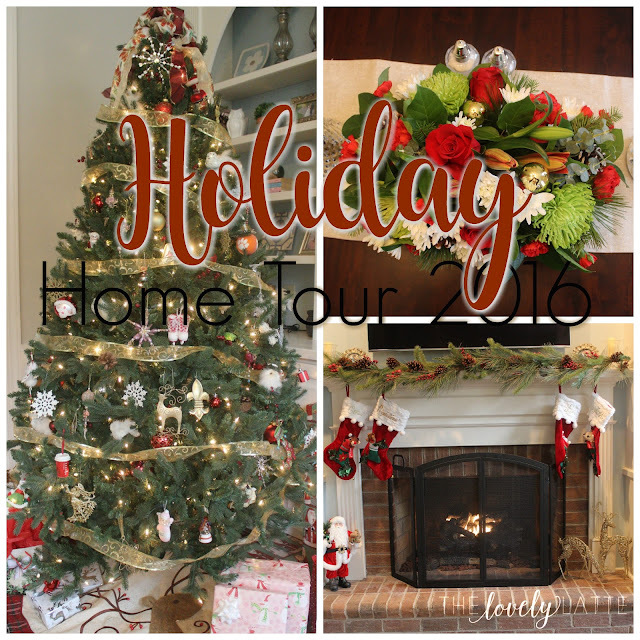 I love how festive your home looks. I think all new moms feel the same way, but your home looks great! Happy New Year!